Maltodextrin, Bulking Agents: Microcrystalline Cellulose & Gum Acacia, Choline (as Bitartrate), Vitamin C (Ascorbic Acid [Carriers: Hydroxypropylmethylcellulose & Tartaric Acid]), Standardised Lignans, Pantothenic Acid (as Calcium Salt), Magnesium Oxide, Vitamin E Natural Source (as D Alpha Tocopheryl Acid Succinate) (from Soya), L-Cysteine, Tablet Coating (Glycerin, Hydroxypropylmethylcellulose, Hydroxypropylcellulose, Caprilic/Capric Triglycerides, Natural Source Colours [Titanium Dioxide, Iron Oxides]), L-Lysine, N-Acetyl Cysteine, L-Methionine, Myo-Inositol (Carrier: Acacia Gum), Niacin (Nicotinamide), Zinc Sulphate, Silicon Dioxide (Colloidal Silica), Para Amino Benzoic Acid, Anti-Caking Agents: Stearic Acid & Magnesium Stearate, Ferrous Fumarate, Thiamin (Vitamin B1 Mononitrate), Vitamin B6 (Pyridoxine HCl), Betacarotene (Carriers: Starch, Water, Antioxidant: DL-Alpha Tocopherol), Riboflavin, Vitamin D3 (Cholecalciferol [Carriers: Acacia, Sucrose, Corn Starch, Medium Chain Triglycerides, Antioxidant: DL Alpha Tocopherol]), Grape Seed Extract, Copper Sulphate, Manganese Sulphate, Folic Acid (as Pteroylmonoglutamic Acid), Sodium Selenate, Chromium Trichloride, Potassium Iodide, Biotin, Vitamin B12 (Cyanocobalamin). Allergy Advice: For allergens, see ingredients in bold. Swallow each with water or a cold drink. Not to be chewed. Do not exceed the recommended intake. To be taken on a full stomach. 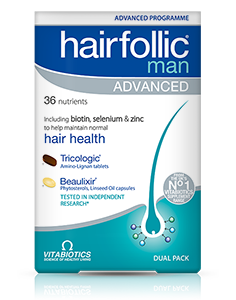 Hairfollic Man Advanced provides 30 tablets and 30 capsules (15 days supply). Allergy Advice: For allergens, see ingredients in bold. Made in a site that may handle nuts. Not be taken on an empty stomach. To protect the ingredients in Hairfollic, always store as directed below. Why has Hairfollic Man Advanced been developed? Who can use Hairfollic Man Advanced? How and when should Hairfollic Man Advanced be used? Can Hairfollic Man Advanced be taken simultaneously with medications? 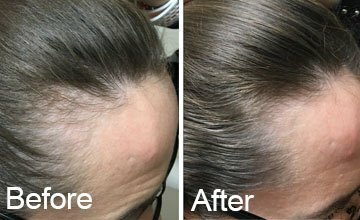 Are there any undesired effects whilst taking Hairfollic Man Advanced? How long will I have to take Hairfollic Man Advanced before I can expect to see benefits? Should I take a multivitamin together with Hairfollic Man Advanced? 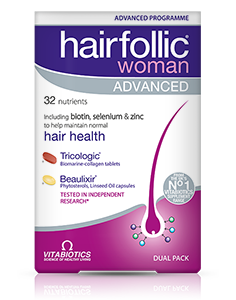 Hairfollic Man Advanced is a dual pack advanced programme of bio-active nutrients based on the latest scientific research. It has been scientifically formulated to provide a comprehensive spectrum of nutrients including biotin, selenium and zinc which contribute to the maintenance of normal hair and copper which contributes to normal hair pigmentation. As well as the Beaulixir® capsule, a complex of fatty acids and phytosterols shown in research to support healthy hair density and growth. Hairfollic Man Advanced may be used by individuals who are concerned about the appearance and general condition of their hair or scalp or by those showing age-related changes wishing to help support the hair’s nutritional needs and support the maintenance of normal hair. Two tablets and two Beaulixir® capsules per day are recommended with or immediately after your main meal, with water or a cold drink. Taking the tablets and capsules with a large meal maximises the absorption of the nutrients and can reduce potential nausea, which can sometimes be experienced when taken on an empty stomach. Hairfollic Man Advanced tablets and capsules should not be chewed. 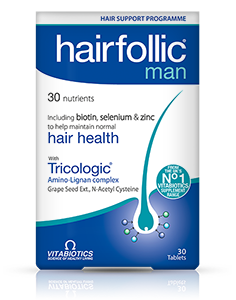 Hairfollic Man Advanced has no known side-effects when taken as directed. Do not exceed the recommended daily intake of tablets. In case of overdose, seek medical advice immediately. Diabetics should consult their doctor before using this product. Results vary amongst individuals, but in most cases, we would expect the beneficial effects of the bio-active nutrients in Hairfollic Man Advanced tablets to build over several months. There is no maximum length of time over which Hairfollic Man Advanced tablets may be used. A regular intake is recommended. 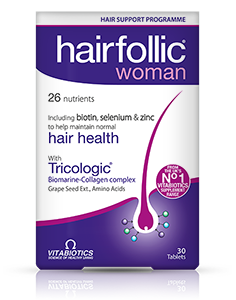 Hairfollic Man provides a comprehensive balance of nutrients, which means there is no need to take an additional multivitamin.